The US Federal Reserve may have underestimated the looming 2007 global financial crisis, released transcripts from its meetings that year have shown. The documents suggested Fed Governor Ben Bernanke wanted to hold off from addressing rising panic in the markets. He said in December of that year that he did not "expect insolvency or near insolvency among major financial institutions". 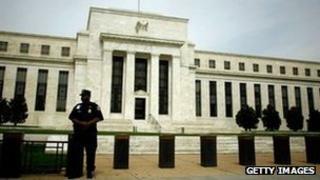 Yet many US banks and other financial firms had to be rescued in 2008. With most of the country's major lenders discovering billion-dollar losses linked to bad mortgage debt as the US housing market collapsed, investment banks such as Bear Stearns needed government funds ahead of being sold off cheaply, while another, Lehman Brothers, was ultimately closed down. In 2008, the US government also had to bailout the federal mortgage agencies, Fannie Mae and Freddie Mac. Although the financial crisis started in the US as a result of the sharp downturn in the country's housing market, it quickly spread around the world as US mortgage debt had been repackaged and sold to banks and other financial institutions around the globe. The released Fed documents from 2007 also suggest current US Treasury Secretary Timothy Geithner underestimated the crisis. Mr Geithner, who at the time was president of the New York Federal Reserve Bank, said in August of that year: "We have no indication that the major, more diversified institutions are facing any funding pressure." Meanwhile in October 2007 Janet Yellen, another member of the Fed's most senior committee, the Federal Open Market Committee, said: "I think the most likely outcome is that the economy will move forward toward a soft landing." The Fed did, however, take some action in 2007 to try to resolve the growing problems in the financial sector, cutting US interest rates three times. In September it reduced its core rate to 4.75% from 5.25%, where it had been for more than a year. Two other rate cuts followed by the end of the year, before numerous further reductions in 2008. And Ms Yellen said in December that "the possibilities of a credit crunch developing and of the economy slipping into a recession seem all too real". US rates currently stand at between 0% and 0.25%, where they have been since December 2008.